Globtek is pleased to announce availability of our GTM91099 model 24V, 60W output power supply, with a high surge power feature, of 7.5A (180W) output capability for 100mS pulse time. This model is DoE Efficiency Level VI compliant, and safety certified for Medical, ITE and general purpose products. This capability is ideal for handling motor starting current surges, electric valves, and other types of gear. 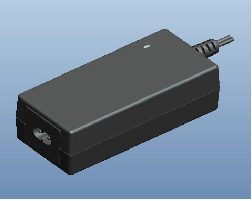 Due to its small size, and economic 60W design, it can help keep OEM product system costs under control. Please contact sales for specific application support. Globtek can work with you to verify surge loading capability with your actual hardware, and custom tailor a solution.